"This is Tinker Bell. 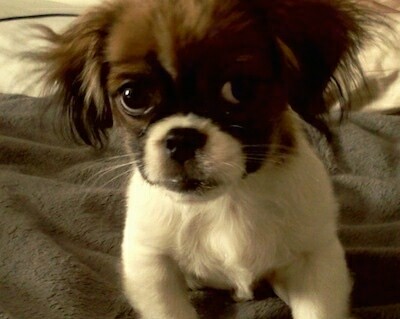 She is a mix between a Pekingese (her mother) and a Chihuahua (her father). My daughter and I call her our Peke-huahua. She is 4 months old in this picture and is very loyal, smart and kind. She is a very playful dog and does great with kids; if she starts getting too rough all I have to say is Tink that's enough and she will stop. She loves going walking with us and she gets plenty of exercise. She is a very good dog altogether. 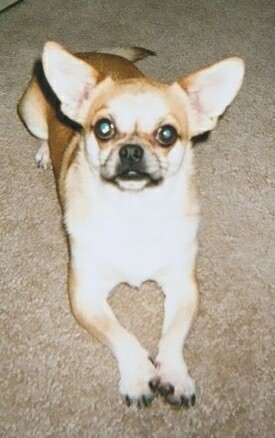 I have never loved another animal like I do my Tinker Bell." The Cheeks is not a purebred dog. 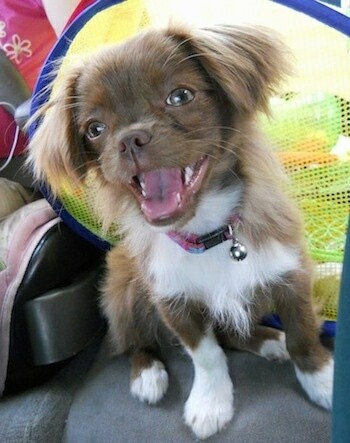 It is a cross between the Chihuahua and the Pekingese. The best way to determine the temperament of a mixed breed is to look up all breeds in the cross and know you can get any combination of any of the characteristics found in either breed. Not all of these designer hybrid dogs being bred are 50% purebred to 50% purebred. It is very common for breeders to breed multi-generation crosses. "Scooter is a two-year-old Pekachi. 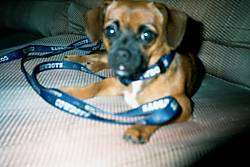 He was a rescue dog who I adopted when he was six months old. Scooter is so playful and very smart. He has many friends, both dogs and people. He hasn't found a squeaky toy that he doesn't love. When he was a puppy he would squeak them until he fell asleep and then wake himself up with the squeak. He is very bow-legged but that has never stopped him from taking long walks every day or racing around the yard with his buddies. We love the heart Scooter makes with his front legs! Scooter had not been socialized when I adopted him. I brought him to Ahimsa Saturday play dates for small dogs (there is a trainer at every play date, which really helped with Scooter’s learning to socialize) and after about three weeks of Scooter being so in fear of everything and everyone and snapping and snarling at all the dogs, Scooter decided that playing with all the doggies just might be more fun. We still go to play dates every Saturday and Scooter is now the Ambassador for greeting all the new doggies that come. He is a sweetheart for sure!" This is Punkie. She is a Pekingese / Chihuahua (Cheeks). This is Bubba the Cheeks at 6 months old. His owner says, He's the Star in the house, he always keeps us entertained. He is very sweet and playful. We love him very much." Franklin the Cheeks hybrid puppy at 20 weeks old—"Franklin is such a sweet boy. He loves to play and is great with people and children." Baby boy Beau the Cheeks at 10 weeks old—his father is a white Chihuahua and his mother is a fawn Pekingese. Brandy Doggie Dog lived to be 15½ years old. She passed away in May of 2003. The baby of the house, Trooper Victor Duverge at 7 months old. 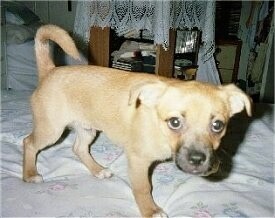 He is a Pekingese / Chihuahua mix. This little cutie is named Lizzy. Lizzy is a 6-month, 7-lb. Chihuahua / Pekingese mix. "She has LOTS of energy and is extremely loving. She has been to kindergarten puppy training and will "sit," "shake" and "down" on command (if she's in a good mood). Her ears have a mind of their own. They will stand straight up (Chihuahua) for a week or so, then they will flop down, like in the photo, the next week. Everything about her is pretty much that way. She definitely has a mind of her own."